Second edition update of the popular "Spring 1942" game (ww2v4), which itself was an update of "Revised" (ww2v2). 1. 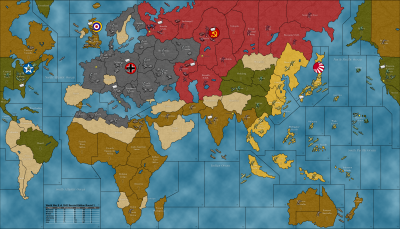 Several territories/SZs added or modified. 2. More initial starting units (including new Factories on Karelia and India). 3. Armor cost increased to 6 PUs. 4. AA Guns now cost 5 PUs and each can fire at a maximum of 3 planes, each plane being only fired upon once, and they can be combat casualties. 5. Factories now have their own AA to defend during strategic bombing. 6. Honolulu is now a Victory City.